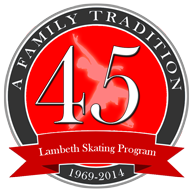 The Lambeth Skating Program has been one of the leading skating schools in the Southwestern Ontario region since 1949. Our instructors are experienced in all technical aspects of both figure and power skating. They take pride in helping develop some of the best skating talent in this area. At the heart of this family run operation, is the ideology that skating is an activity that can involve the entire family. There is no limit to age or ability. Everyone can benefit.